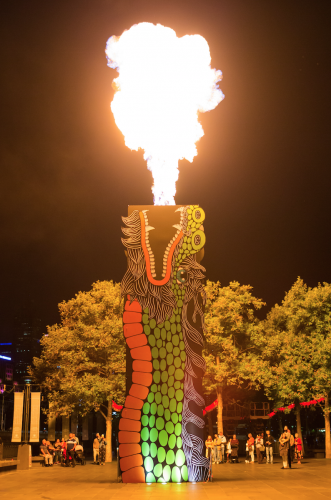 To mark 2018’s Lunar NY, Crown Melbourne’s famous Fire Towers have been transformed into fire breathing dragons, in a unique artistic outdoor installation produced and developed by Geometry Australia (concept by TBWA Melbourne). Aimed at driving foot traffic and marketing Crown Melbourne’s entertainment area, the installation showcases five unique dragon panels, designed and built around Crown’s established fire flumes. Each dragon was created as a piece of art by five of Australia’s leading local street artists over one weekend, with Geometry working alongside Pulse Communications to execute the idea. Geometry CEO Sean Taylor said the installation combined two iconic symbols; the fire towers long associated with Crown Melbourne, and the dragons celebrated during Lunar NY. “The Fire Dragon installation is a simple but powerfully photogenic outdoor idea that aims to entice locals and visitors to consider Crown Melbourne as a must-see destination this Lunar NY. By utilising talented local artists, we have created something completely unique and engaging for Crown and Melbourne’s artistic community, to mark Lunar NY,” he said. The makeover of Crown’s fire towers will be visible until Sunday 25th February 2018.